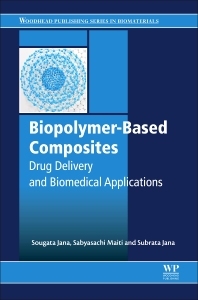 Biopolymer-Based Composites: Drug Delivery and Biomedical Applications presents a comprehensive review on recent developments in biopolymer-based composites and their use in drug delivery and biomedical applications. The information contained in this book is critical for the more efficient use of composites, as detailed up-to-date information is a pre-requirement. The information provided brings cutting-edge developments to the attention of young investigators to encourage further advances in the field of bio-composite research. Currently, biopolymers are being investigated for the design of various drug delivery and biomedical devices due to their non-toxic, biodegradable and biocompatible nature. Mostly, biopolymer-based solid orals, gels, hydrogel beads, and transdermal matrices have been designed in order to control drug/protein release in simulated bio-fluids. Sougata Jana is a B. Pharm (Gold Medalist) from West Bengal University of Technology, Kolkata, and M. Pharm (Pharmaceutics) from Biju Patnaik University of Technology, Odisha, India. He worked as an Assistant Professor, at Gupta College of Technological Sciences, Asansol, West Bengal, India. Currently, he is working at the Department of Health and Family Welfare, Directorate of Health Services, Kolkata, India. He is engaged in pharmaceutical education and research for the last 11years. IPA Bengal branch, Kolkata, India conferred upon him “M.N Dev Memorial Award” for securing the highest marks in the state of West Bengal in 2005. He bragged ‘Best Poster Presentation Award’ at 21st West Bengal State Science and Technology Congress-2014, and “Outstanding Paper Award” at 1st Regional Science and Technology Congress-2016, organized by Department of Science and Technology, Govt. of West Bengal, India. He has 30 publications in different national and international peer reviewed journals. He edited books in Springer, Elsevier and Pharmamedix India Publication Pvt. Ltd. He has contributed more than 25 book chapters with Elsevier, Springer, Wiley VCH, CRC Press, Taylor & Francis group. His research area of interest includes modification of synthetic and natural biopolymers, microparticles, nanoparticles, semisolids and interpenetrating network system for controlled drug delivery. Sabyasachi Maiti is an M. Pharm, Ph.D from Jadavpur University, Kolkata, India. He is Associate Professor at the Department of Pharmacy, Indira Gandhi National Tribal University (Central University), Amarkantak, Madhya Pradesh, India. Dr Maiti has over 15 years experience in the field of pharmaceutical education and research. His research focusses on chemical modification of natural polysaccharides, characterization and their application in the design of novel drug delivery carriers. His research has been recognised by international peers in his field and he has more than 50 publications to his credit. He sits on numerous reviewer panels for international journals of repute, has edited multiple reference works and has written over 25 book chapters. Prof. Subrata Jana obtained his PhD in organic chemistry from the Indian Institute of Engineering Science and Technology (IIEST), Shibpur, India. His doctoral work was based on the design and synthesis of abiotic receptors for the recognition of biologically active neutral molecules and ions along with development synthetic methodologies. After that he moved to the University of Victoria, Canada, to work with Dr Fraser Hof on supramolecular and medicinal chemistry as a post-doctoral fellow, where he worked on the synthesis of different receptors targeting N-methylated protein residue along with anions. He then moved on to work with Dr Kenneth J Woycechowsky at University of Utah, USA, on protein engineering and enzyme catalysis as a post-doctoral research associate. He studied enzyme activity when it is encapsulated inside the capsid which is a nano carrier and an excellent delivery vehicle for important biological substrate including drug molecules. Presently, he is working as an associate professor at VEC, Sarguja University, Ambikapur, Chhattisgarh, India and his current research focuses on design and synthesis of artificial receptors for the recognition of anions, cations and N-methylated protein residue. So far he has published ~40 research paper in peer reviewed international journals and more than 10 chapters in different edited books published by internationally-renowned publishers.